UPPER EAST SIDE — A barricade separating businesses on Second Avenue from adjacent subway construction has been blamed for driving away customers and for creating safety hazards — but one restaurant has found a way to make the best of a bad situation. 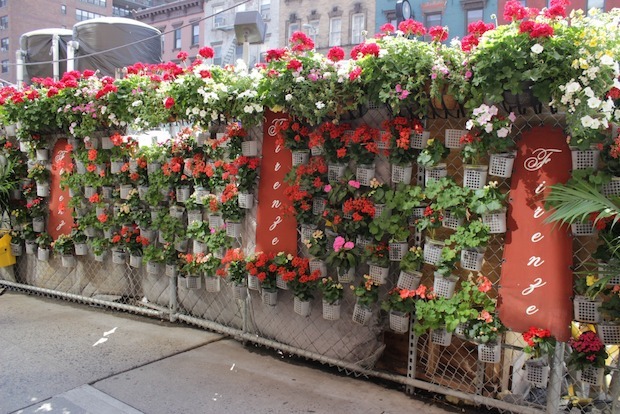 Firenze, a cozy Italian bistro between East 82nd and 83rd streets, built a hanging flower garden on a section of the fence across from the restaurant’s small front patio, in an effort to disguise the unsightly barricade and attract costumers. Owner Emanuele Caisaguano said his restaurant, like many others, has been hard hit by the ongoing project. Firenze opened in 1981, but Caisaguano took ownership in 2001 after previously working at the restaurant. The neighborhood bistro is known for Tuscan specialties such as Ribollita soup and homemade pappardelle pasta with beef ragu. Caisaguano came up with the idea of the garden as a way to hide the construction site from customers' view, setting it up every year for the past four summers. Each year, he changes the theme of the garden, incorporating different plants and colors. This year, Caisaguano chose to go with a red and white design, made up mostly of geraniums. He said that the flower wall has helped to improve business. Caisaguano does the gardening himself, taking time on Sundays, his day off, to freshen up the hanging baskets of various sizes. Maria Everly, 32, recently stopped to admire Caisaguano's handiwork and said she remembered previous years' displays. "It's so pretty and different," she said "It's really smart to cover the construction like this." Jeanee Sigal has lived in the neighborhood for 20 years and said she appreciated Firenze's attempts at beautification. "I think it takes away a bit from the horrors of what we've been subjected to with the construction," she said. "It was a lovely thought to try to make something beautiful out of a bad situation." Some other businesses have hung up signs on the fence, but to Caisaguano’s knowledge, no one else has developed such a display. He said the MTA has never approached him to complain about his use of the fence, and an agency spokesman even complimented his work. "The flowers and plants look very nice," the spokesman said.